The best literacy board games for 7-year-olds are games that place fun first rather than explicitly trying to teach reading and comprehension. Most 7-year-olds are capable independent readers and are just working to enhance their existing literacy skills and broaden their vocabularies. Games they can play with family and friends are best, and it's good to introduce a variety of board games that will cater to kids with short and long attention spans and kids of all learning levels. Parents generally know their kids' reading levels and abilities best, so if you're searching for a game for a kid that isn't your own, consult with his or her parents to try to find a game that will be a good fit. These games are classics for a reason: they've stood the test of time, and kids of today enjoy them just as much as kids and families did when they were first introduced years ago. They're particularly good at promoting literacy and helping kids learn new words, and most importantly, they're fun! 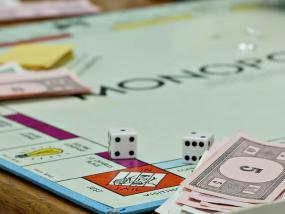 The Parker Brothers family favorite is the best-selling board game in the world. It's a great one for kids because it can hold their attention spans for a long time (Monopoly tends to last for an hour or more), and it will help kids pick up concepts of finance and money management as well as exercise their comprehension abilities. Reading and carrying out the directions on Chance and Community Chest cards are great vocabulary-enhancing activities for 7-year-olds, too. Finally, the game involves a lot of negotiating and talking back and forth between players, so younger kids, from discussing what's going on, will get a good sense of how each individual game part fits into the whole. Boggle is another popular family game and is perhaps best suited toward kids who have more advanced vocabularies and who already like to read. Rather than being played on a board, Boggle has a series of lettered dice that are shaken in a container and then used to form words. Most words in the game are short (three or four letters), so Boggle is a great literacy board game for 7-year-olds, since they'll likely recognize words in the dice and be able to form them on their own or with minimal help. Since rounds of Boggle are short (each is timed), it's also a good choice for kids with short attention spans. A favorite with younger kids, Candyland is a colorful, fun game that is easy to set up and play. For reluctant readers and kids with emerging literacy skills, Candyland is a wise choice because it won't challenge them to the point of frustration, but it will encourage them to practice and use the literacy skills they already have. Cards in Candyland mostly use pictures rather than words to point out areas on the board, so it's a very accessible game for kids who don't yet feel confident in their reading abilities. Guess Who? is a fun, engaging game for almost all younger kids. A series of characters are depicted on the game board, and each player draws a card with one character on it. That character is kept a secret from the other player, and players have to ask questions about the secret characters and ultimately make guesses about who the other player's character might be. The twist in Guess Who? is that literacy skills aren't directly developed through cards or reading but through devising and asking questions about the other player's character. If you're still searching for more options, consider junior versions of popular adult board games. The makers of Scrabble and Pictionary both manufacture versions of those games that are geared to young children and can help them improve their literacy skills and prepare for the full versions of those games. Remember that one of the most valuable tools to help a child improve literacy is you and your time, so break out the board games and have fun!